Slieve Beg sits at the northern end of a ridge of mountains that separate the Annalong Valley from the joint Silent Valley/Ben Crom Valleys. 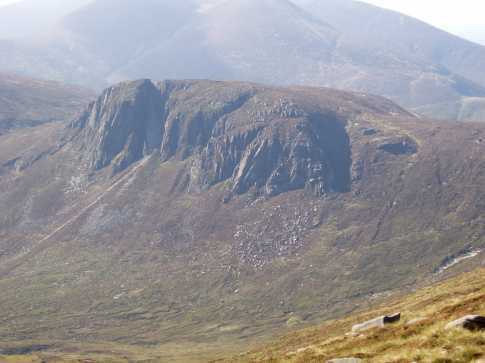 Slieve Beg (Little Mountain) is well named as it is surrounded to the west, north and east by higher mountains such as Donard, Commedagh, Bearnagh, Cove, Lamagan and Chimney Rock. However what it lacks in stature it more than makes up for in its eastern face, which is made up of sheer cliffs and the infamous Devils Coach Road – a fearsome steep gully that should only be tackled by the very experienced. Coming off Cove, heading manfully towards Commedagh or ‘tother way off the Pad into her dusty skirt tails, you could just about miss her. A couple of steps and you’re on her “summit”. I wandered her three or four times in treacle mist before I learned what you could get yourself into - or downto. I stood at the top of the Coachroad gully as the mirk cleared and felt my breakfast shift. Two or three runs later and a parched summer day circa 96 and big shot here instead of respectfully tipping his hat to eternity en passant, took a lep over the lip and down through ghost-like granite and increasing inclines to a world of ripped knees, torns fingers and a terror the temperature of dead meat. ricky k astutely describes this bat’s nest as “as a quick descent to the valley”. Like all these idiot circumstances we get ourselves into, it’s the fear that’ll kill us quicker than gravity - although of course, one can lead to the other. Any thoughts of vistas and such, vanish into each blade-clear crack as it clicks and whispers under your weight. Suddenly you’re on the valley and the Annalong track - too suddenly is bad. You will look back up and shout “I did that - wow!” and repeat it several times before you shake yourself out of the trauma. And of course you must do it again - that was 96 and this is 2004. Picture from wicklore : Looking down the Devils Coach Road - can you see the person below? Picture: Looking down the Devils Coach Road - can you see the person below? For a small hill Slieve Beg has a fierce summit. It is simple to reach the summit from the Brandy Pad but the top has sheer drops on its SE side. These sheer drops include the infamous Devils Coach Road. 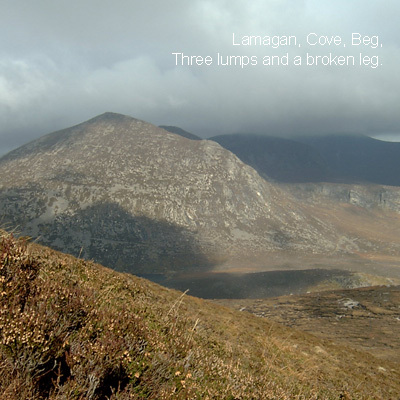 McClimber gave us a most interesting talk about it when a few of us renegades broke off the main Scavenger Walk in August to pass near Slieve Beg. I recently came back to climb Slieve Beg and see the fearsome gully. 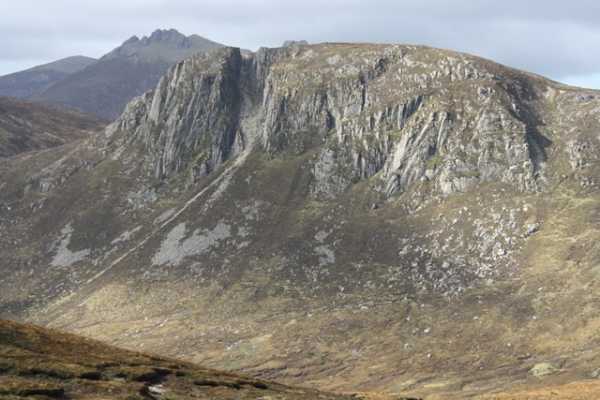 Slieve Beg would be little more than an incidental top on the spine of the Mournes climaxing in Slieve Binnian were it not for the impressive eastern ramparts and the dramatic rent of the Devil's Coachroad, into whose depths many summiteers have gazed in awe. 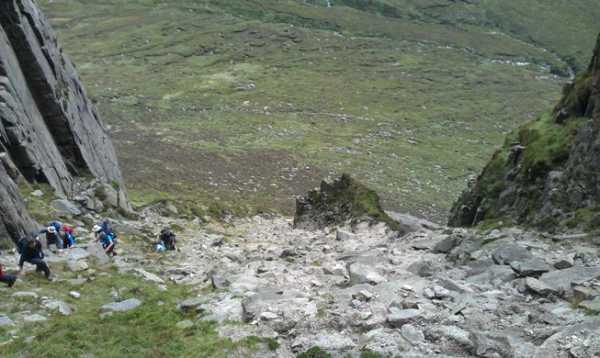 An ascent of the Coachroad is actually a feasible undertaking for most non-nervous hillwalkers: what looks very testing in theory turns out to be fairly reasonable in practice, with the terrain requiring more clambering than actual scrambling. It's best approached by continuing a little past it on the walk up the Annalong Valley, before cutting back and contouring to its base (a direct approach looks purgatorial). Anyone comfortable with the level of exposure experienced at the foot of the gully will not be troubled any further during the actual ascent. 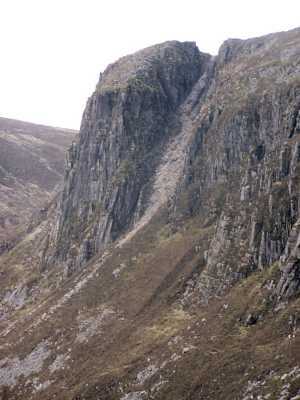 The initial ascent into the jaws of the Coachroad is up a steep and shifting slope: if you are not alone you will need to take care to avoid dislodging stones and to avoid any which may have been dislodged by others. 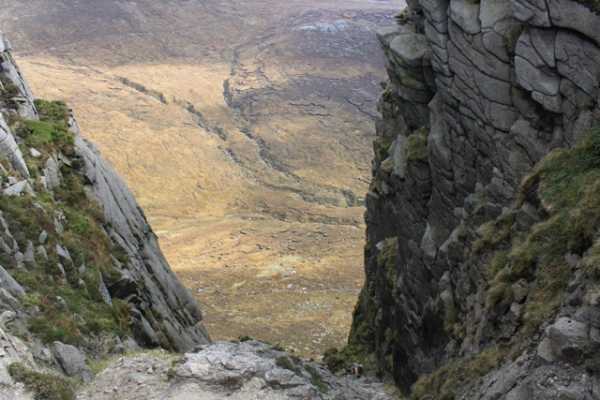 Soon the walls close in and after more loose scree the route is split by a rib of rock in the floor of the gully. Ongoing passage can be accomplished on either side of this, with the odd fairly straightforward (and secure) thrutching/bridging scrambling move required. At the end of the rib is the slightly gritty headwall: I'm reliably informed that it's easier to tread right (looking up) to climb this but I found the swarm up the left hand side quite easy too. It's short-lived anyway, and debouches directly onto the summit.